The dress. A one piece that comes in countless shapes, fabrics, lengths and styles. Dresses have been worn for centuries by people all over the world. Whether they have been for fashion, style, versatility or practicality, dress designers throughout history have all taken 'the dress' and transformed it with their vision of what they think a dress should be, what it should look like and why. I love dresses and how they make me feel. In a dress I feel comfortable, feminine and effortlessly stylish. This season I have seen some amazing dresses and I want them all. What I love is that some of these trends have repeatedly returned to the spotlight time after time so investing in some of these pieces means you have something classic and timeless. 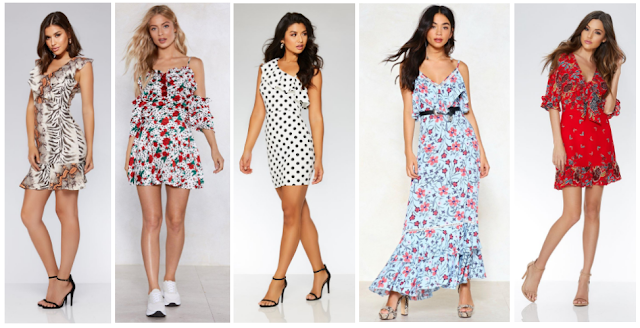 Here are my top 5 dress trends I've seen this summer and why I love them. Stripes have never ever really gone out of style. It's a pattern that never really grows old but in time, I feel, only gets better. My favourite stripes are usually in a nautical colour scheme because not only do the colours compliment so many people's skin tones but stripes can flatter so many body shapes too. On top of it all, it's a classic and timeless style. I love how this season I've seen stripes being portrayed in various ways. I've seen sporty stripes (not my fave but still really cool), lots of vertical stripes and my favourite, nautical stripes in red, white and blue. Bardot necklines remind me of the 90s. I was a 90s kid and so I remember seeing bardot necklines and begging my mum to buy me tops with them. I've loved seeing them again and have a few pieces with this neckline now from the last couple of years. I like that it's a style that hasn't yet been put aside for another 10-20 years but is being played with and embraced. I don't suit particular bardot styles because it doesn't sit right for me but there are some I really like. I love ones that are supported with spaghetti straps because it means they're not always pinging back from my arms. I'm also a fan of the ones that are only attached under the arm making it easier to move in. Basically, I love bardots that give me unlimted movement still... Practicality! I have forever been a fan of tropical prints and love seeing that they're back again this year. The trend reminds me of the summer time and being on holiday. The idea of 'tropical' looks different to so many designers so I love how it's interpreted in so many different ways. People see tropical so differently and think about it differently. Some think of bright and bold colours, some think specific plants and some think of the style of dress and whether it suits a tropical climate. As you can see from the selection of dresses above, it can look beautiful in so many ways which is the main reason I love this trend so much. It's something that can easily be worn every summer and although not an all-year-round style it's one that can be saved in the wardrobe for this time again next year or for your next holiday. My feelings on ruffles often change. Sometimes I love them and sometimes I really can't stand them. It all depends on how they are styled and like tropical prints, ruffles can be interpreted in lots of ways. They can look very different and can change the way a dress looks. I love multiple ruffles myself and I love ones that are on the neckline best. Either way, ruffles can look either super puffy or super cute - it just depends how they've been styled. This season I'm a fan of this trend and I think they look quite feminine while adding a lot of detail to even the simplest of dresses. I have a few dresses with ruffles and I think I need to make more use of them before the trends change for Autumn. This has got to be my most favourite dress trend this season. Or maybe even this year! I don't know what it is about yellow at the moment but I'm in love with it. So much so that my accent colour in my new living room is yellow too. Anyway. This season I have seen the most amazing yellow dresses in so many styles. The first one I saw and fell in love with is the one on the very far right. It reminded me of a dress I had when I was a kid and I remember loving that dress to pieces. It was orange so not far from this one but I'm super tempted to buy it still for nostalgic reasons as well as the fact that I love the shape, length and the colour is just PERFECT. Yellow is a colour I feel a lot of people steer away from and it's a colour I often don't see when I'm out shopping. I'm glad to see that it's boomed this spring and summer and has become a colour I've seen so many people wearing. It suits so many skin tones - if not all skin tones and I just simply love it. Rock that yellow people! 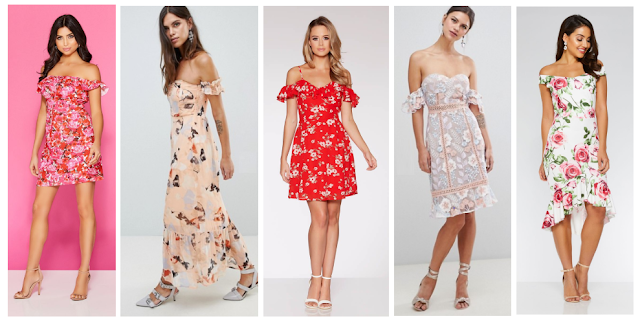 What have been your favourite dress trends this summer? Is there a colour or a style that's been catching your eye. Share them with me in the comments below!